This sequence of images from a sound-activated still camera fitted with a fisheye lens was stitched together to provide a unique perspective of the Lockheed Martin Atlas 5 rocket blasting off from Complex 41 with the Inmarsat spacecraft. As if drawn by an artist, this sublime scene speaks of the powerful beauty in the outer solar system: the domain of giant planets encircled by rings and orbited by small cratered moons of ice. In this view, Dione (1,118 kilometers, or 695 miles across, on the left) and Enceladus (505 kilometers, or 314 miles across, on the right) orbit the mighty ringed planet Saturn, while two bright storms swirl in the atmosphere below. This vantage point shows that the deceptively expansive rings are actually paper-thin in comparison--only tens of meters thick. 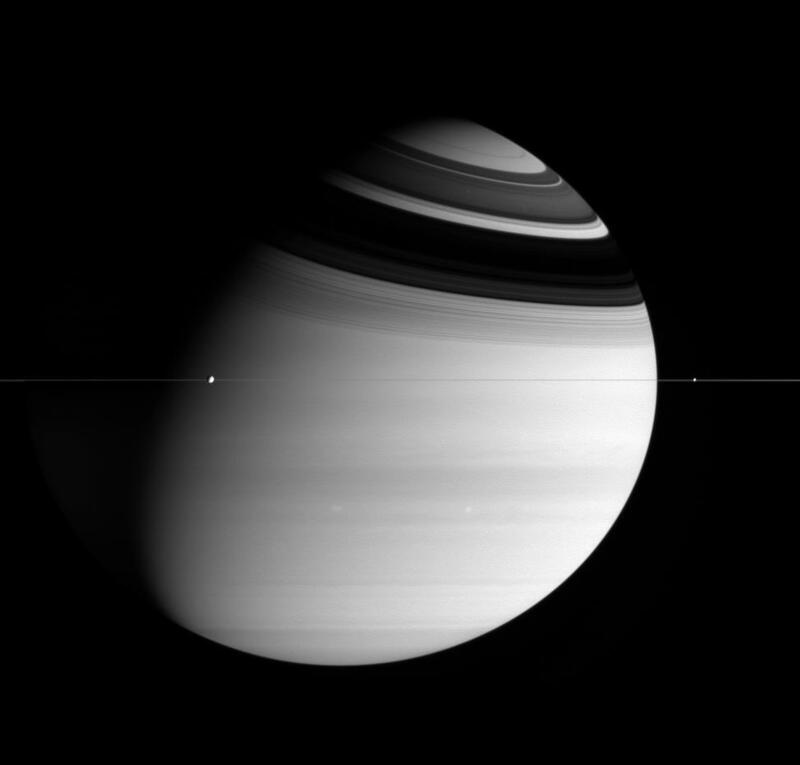 The image was taken in visible blue light with the Cassini spacecraft wide-angle camera at a distance of approximately 2.6 million kilometers (1.6 million miles) from Saturn. The image scale is 154 kilometers (96 miles) per pixel.